OCZ HAS THE largest SSD I have seen to date, it starts at 4TB, and goes up from there, way up, as far as a 32TB RAID from a single card. As far as SSDs go, it looks like the company has products from consumer focused to blatantly silly levels. Last week, OCZ announced their Vertex 3 SSDs, a SATA6 interfaced high performance consumer part. They are based on the Sandforce 2582 controllers, with some firmware tweaks. New at CeBIT were 1.8″ and 3.5″ versions of that drive. The company was demoing them live, and the measured performance was about 550MBps read rate with 70K IOPS, not bad for a 1.8″, and 10% faster than what Sandforce promised. How may times do you see a drive that beats manufacturer’s claims and is limited by interface speeds, not the controller itself? Moving on to the enterprise section, we have some pretty cool drives. The new Z-Drive R3 RM84 is a half height, half length PCIe 8x card based on a Sandforce 1565 controller. This one will read at 1000MBps and pull 135K IOPS, but the best part is it will fit vertically a slim rack mount server or SFF desktop. The R3 RM88 is it’s full size cousin, and with a daughter card, it will read at 1.8GBps and write at 1.6 while delivering over 200K IOPS. The best thing about them is that they are bootable. Next to them we have the Helios drives, OCZs SAS lineup. They are also Sandforce based, and bring another player in to the enterprise SSD and SAN space. Helios drives come in 2.5″ and 3.5″ versions. The last new enterprise drives from OCZ are the Deneva2 parts. You will probably never see a Deneva 2 as such, they are meant to be for enterprises who need custom firmware for a specific application. Denevas will almost assuredly be re-branded as something else, or simply part of a task specific box that you purchase as a unit, a router or firewall for example. There is a lot of call for this kind of drive, but not much attention is given to the finished product, it would take away from the OEM that incorporates it into a device. From there we go from really expensive enterprise products to downright silly expensive drives. How expensive? No one is really sure, at 4TB it depends more on the price of flash when you order, but it is a lot. 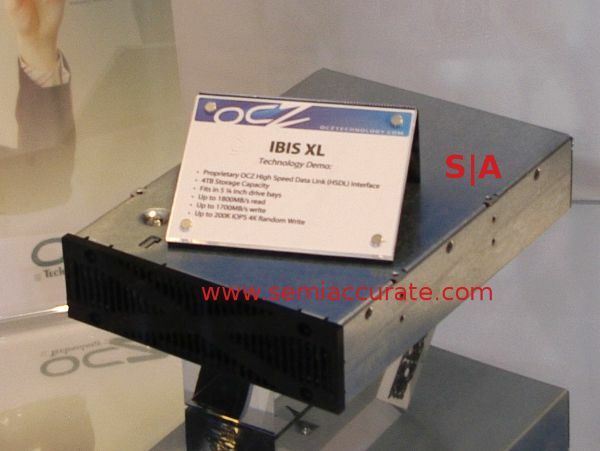 The Ibis XL is a 5.25″ drive that connects over OCZ’s HSDL link, basically a proprietary interface that ties in to drives like the Ibis line. You can put four of these drives on a singe HSDL PCIe 8x card. Getting back to the drive itself, the Ibis XL starts at 4TB, and can go to 8TB for now. If 8TB isn’t enough, well, you can chain 4 of them together in a single RAID volume for a 32TB RAID array. Each XL is capable of 200K IOPS, so the RAID volume should sustain over 750K with a fair bit of ease. It isn’t the magic 1,000,000 IOPS barrier, but the Ibis XL brings things tantalizingly close. That barrier is sure to fall with the next revision. If you can’t wait, you can always buy two Ibis XL arrays and stripe them, that should be enough speed for casual browsing and flash games, not to mention storing a few Libraries of Congress or 1/17th of the average internet users adult cinema collection.